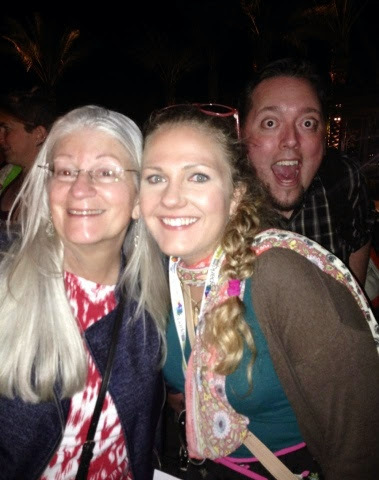 Art With Mr. E: Photobomb Phyl! Do you know Phyl? She is the blogger behind There's a Dragon in My Art Room! We have been blog buddies for several years now..but have never met...till tonight! She is as lively & fun as I thought she'd be!!! What a joy to be able to actually spend some time with great people like Phyl! I love NAEA14!! Stay tuned....much more to come. Oh...and go to my blog roll to the left & look up Phyl's blog!! Why in the world are we both still awake? Big day tomorrow, and we are both playing with blogger!! Thanks for sharing this photo! Was so star struck that night! Thank you for sharing Mr. E.
:) Hey their Tasha!!! Know you can e-mail any time with questions or comments...just drop me a line. We're all in this thing together!!! !